His (Babaji's) coming had been foretold, both by ancient scriptures and by the preachings and prophesies of a twentieth century saint called Mahendra Baba. As a child, Mahendra Baba was healed by a vision of Babaji and the Divine Mother. He saw Babaji again on a birthday, when Babaji appeared to him and gave him candy. When he graduated from high school, Mahendra Baba met Babaji, in one of his previous forms, and was taught yogic knowledge by Babaji for six days and nights. When Babaji left him, Mahendra Baba renounced the world and went searching for his guru -- walking through the Himalayas. Mahendra Baba then spent years at a temple in the Indian state of Gujarat and developed a reputation as a great saint. Only after 25 years was he led back to the Kumaon hills where Babaji appeared to him again, in a locked room in a remote mountain ashram. 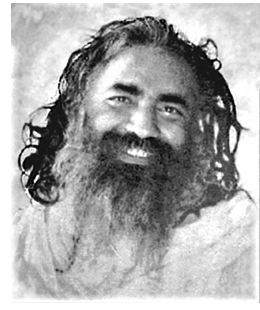 After this appearance of Babaji in the flesh, Mahendra Baba began his mission of preparing for Shri Babaji's return to the world in human form. For many years Mahendra Baba went around India preaching that Babaji would return to transform the world. He described what Babaji would look like, including the scars on his right leg and left arm. He said that Babaji would come in 1970. Mahendra Baba restored old ashrams and temples, built new ones, and prepared the worship service now used by Babaji's devotees. The Haidakhan Arati was cognized by the great saint, Shri Mahendra Maharaj. Mahendra dedicated his entire life to preparing the way for the reappearance of Shri Haidakhan Babaji. He traveled all over India for decades, teaching people the devotional service and establishing ashrams and temples dedicated to Babaji. He unceasingly prayed to Babaji, begging him to return to the earth in physical form for the upliftment of humanity. Amazingly, in 1969 Babaji appeared to Mahendra and promised him he would take form, even showing him what the form would be. This word from Babaji satisfied Mahendra, and he died shortly thereafter, not even sticking around to experience the physical presence of Shri Babaji, thereby enjoying the fruits of his labors. He had performed this service for the benefit of others, not for himself. Babaji did as promised and made Himself known about a year later, in 1970. Mahendra Baba told his followers that Shri Babaji has been a divine presence on earth since man first learned about religion. Babaji has taught gurus and religious teachers throughout man's history, and eras, He has appeared to teach people, manifesting a body for each appearance, rather than coming by human birth.